In Fairy Tile, you create the map of the kingdom and move the fairy tale characters through their story. Use the Pages in your Book to recount the adventure of the princess, the knight, and the dragon. 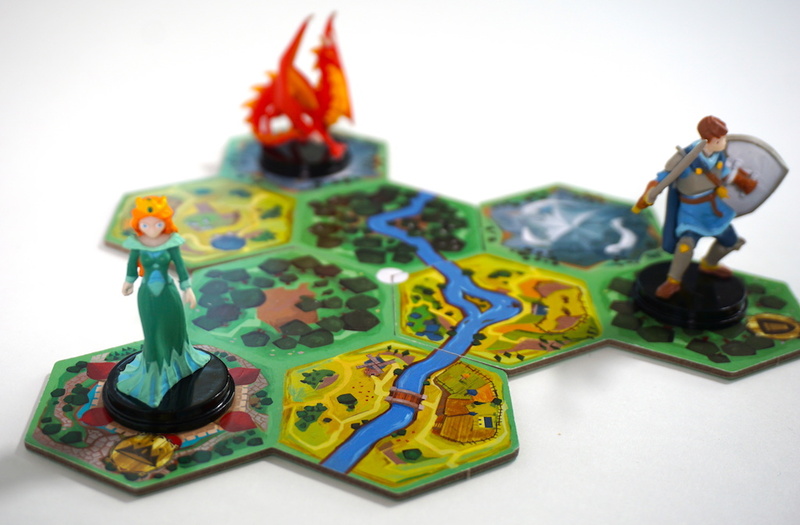 Fairy Tile is a tile-laying and exploration game for 2-4 players. 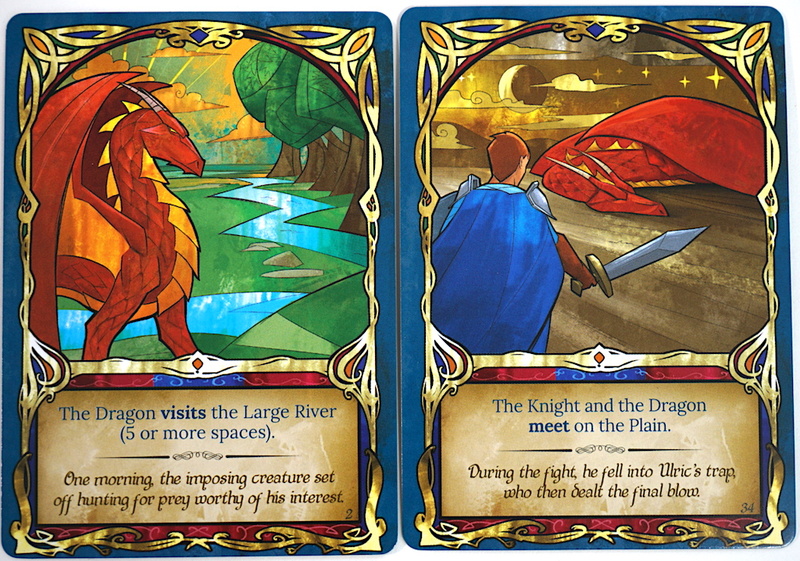 It was designed by Matthew Dunstan and Brett Gilbert, and published in the United States by IELLO. Our adventure begins with a small map of the kingdom (3 starting tiles, totaling 9 terrain hexes) and our 3 characters: a princess, a knight, and a dragon. 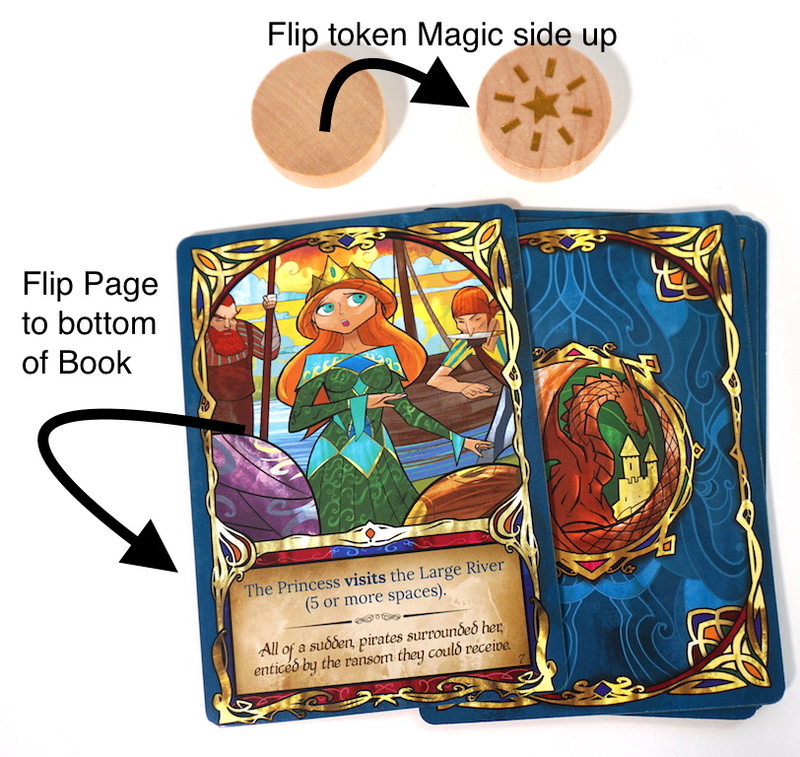 Each player receives a Magic token and a pile of Page cards which forms their Book. We are only allowed to look (secretly) at the first Page in our Book. On my turn, I may either add a land tile or move a character, to help fulfill the conditions of my current Page. Adding land tiles is intuitive; take the top tile from the stack and add it to the map, so that it touches at least two edges of the existing map hexes. I am not allowed to block off the river, but otherwise may place the tile anywhere I’d like. Moving a character is slightly more difficult. Any player can move any character on their turn, but each character moves differently. The princess moves exactly one space, but is also allowed to teleport from one Castle hex to another Castle before or after her move. The knight moves exactly two spaces, and must move away from his starting position; he may not double back or end on a space adjacent to where he started. The dragon flies in a straight line until he reaches the edge of the map. After placing tiles or moving a character, I check whether I have fulfilled the objective on my current Page card. If so, I can “recount the adventure”: place my Page face-up next to my Book and read it out loud. If my current Page is too difficult or not something I want to work on at the current time, I may “turn a Page”. I place my current Page card under the Book (face down) and draw the next Page. This also allows me to flip my Magic token face-up. I may spend my Magic to take an extra action on a future turn. The first person to fulfill & read out all Pages from their Book is the winner. With player-specific goals and the ability to move each character differently, Fairy Tile provides a new twist on asymmetric gameplay that is easy to grasp. Unfortunately, if everyone attempts to advance their goals through the same characters, it can create frustration, especially in younger players. We remind our children that the “turn a Page” action will give them a new card to work on AND an extra action banked for a later turn. 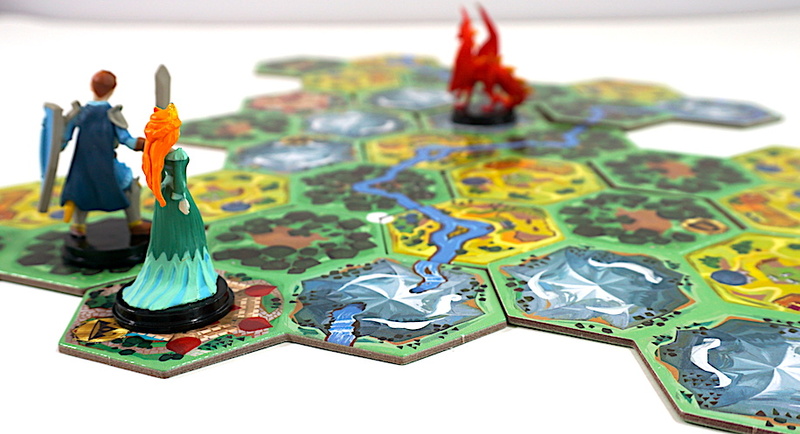 It’s also possible to build the map in such a way that prevents the completion of one or more objectives that include the dragon. If I hold a Page that is impossible to complete, I cannot replace it with something achievable. The rules don’t specify how many cards each player should get, just that they should be equal piles. With 36 cards, it is possible to split the cards evenly, regardless of player count; but we found that 9 cards seemed to give the right game length even with fewer players. The art for Fairy Tile is fantastic. The cards have a beautiful stained-glass look, while the map tiles have enough variation to evoke real terrain. The miniatures add to the feeling of actually moving the characters through their respective storylines. Is Fairy Tile the greatest tale ever told? Not exactly; but all the elements of a classic fairy tale are here: magic, exploration, adventure, and danger. Overall, we enjoyed this as a light and mostly peaceful game. 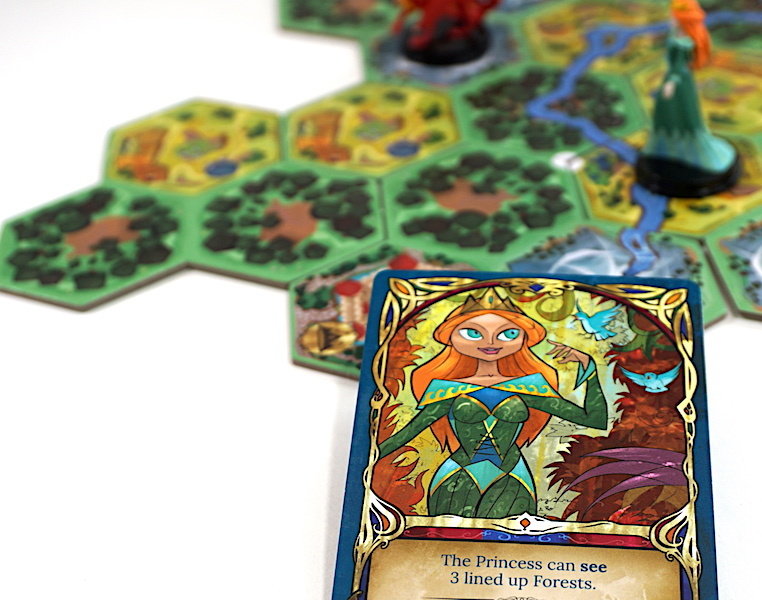 You can lay down your own tile kingdom in Fairy Tile for just $30 at Amazon or at your friendly local game store. 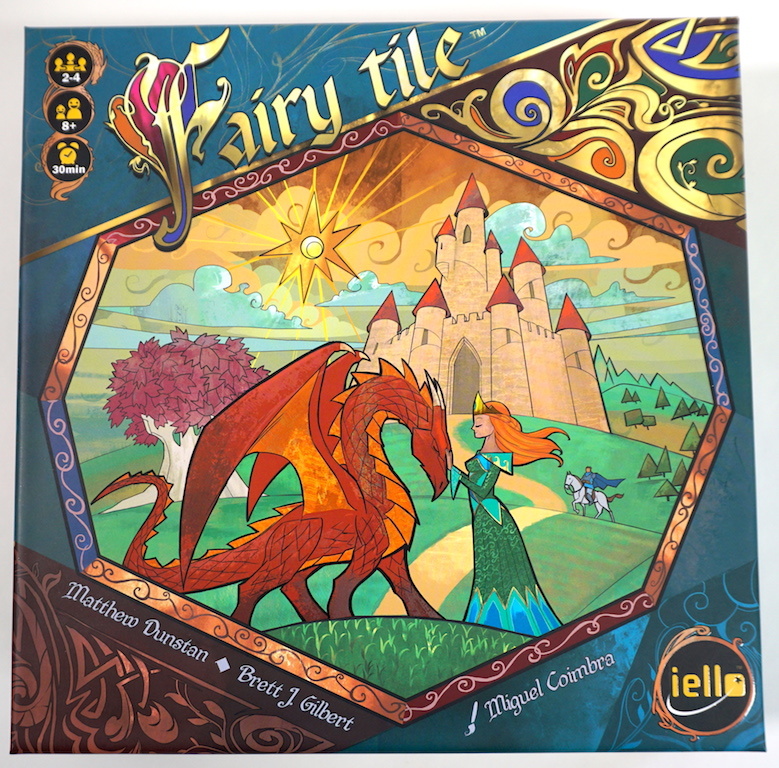 The Family Gamers received a review copy of Fairy Tile from IELLO.